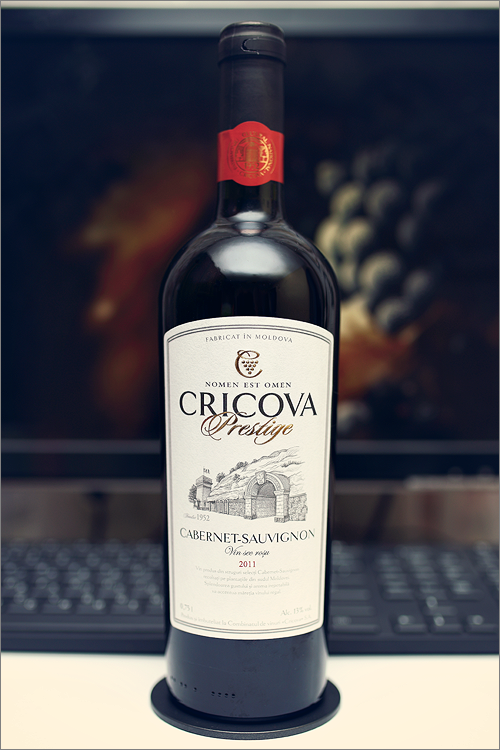 Still on Wine of Moldova and back to the world’s most famous grape variety – the noble cabernet sauvignon – tonight we are going to review a wine, that is a bit forgotten and quite underrated these days – Prestige Cabernet-Sauvignon 2011 from Cricova. A good cabernet sauvignon wine is not a hard find anymore, even here in Moldova, that’s why, without further ado, let’s get directly to the review and let the tasting do the talking. The wine has a deep garnet color, quite opaque, with the rim-color of a clear purple shade. The nose is clean and strong, with no signs of wine faults. It reveals a mix of black fruits and some nuanced savory notes: cranberry, leather, black currant, blackberry, black plum, black pepper, black tea, vanilla, nutmeg, cloves, tobacco and a delicate aroma of a varnished wood. The wine is dry, with no signs of residual sugar. It has moderate, but well integrated alcohol level, high acidity and dry tannin. This is a spicy, lean, leathery but fruity wine – a bit crisp, a bit astringent and a bit bitter. The wine has a fair overall balance – it has a nuanced black fruit profile with strong leathery notes – in other words: velvety and smoky. The wine has a medium finish and a balanced aftertaste. It feels dry but ripe towards the end and it leaves a quite pleasing feeling overall. This is definitely a fine Wine of Moldova and the overall rating says the same, with 89.2 points scored it is right there, among the best wines we’ve tasted so far. Please click on the chart icon on the left in order to get to the wine rating page, where you can find all the wines we’ve tasted to date. Conclusion: this wine has too much leathery notes and is a bit softer on the body than expected from a cabernet sauvignon, but is ripe enough to be uncorked now. We would not recommend it for more bottle ageing, as it displays an optimal balance in current state. We would also like to mention that this wine was already appreciated on the international scene, as it has been awarded a commended award by International Wine Challenge and a silver medal by Concours Mondial de Bruxelles – two of the leading wine-tasting competitions in the world of wine.